Permanent medicine collection programs make it easy for people to rid their homes of unwanted pharmaceuticals, but they can be difficult to get off the ground. That’s where our Unwanted Meds team comes in. They have helped communities across Illinois and Indiana purchase collection boxes and raise awareness of drop-off programs, including Illinois’ Macon County. A few months back, IISG was contacted by Laurie Rasmus of the Macon County Environmental Management Department. She was aware of the issues surrounding improper disposal of pharmaceuticals and wanted to know how we could work together to provide Decatur residents with a convenient way to safely dispose of their unwanted medicines. IISG has found that partnerships like this work really well. So we wanted to start sharing the stories of communities with medicine take-back programs with people who may be thinking about staring a program in their area. Laurie took a few minutes of her time to answer some of our questions about Macon County’s need for prescription take-back boxes and why they are so important to the community. How did you learn about safe medicine disposal, and how did this initiative come about? Our department first learned about safe medicine disposal through the one-day take-back collections sponsored by the DEA. Our office receives many inquiries from residents who want to learn how to dispose of unused and expired medicine in a safe manner that is not harmful to the environment. We informed these residents of the drop-off box operated by the Maroa Police Department. Most were pleased to learn about the Maroa drop-off site but many mentioned that a Decatur-based location would be more convenient. So, we inquired with Illinois-Indiana Sea Grant about the possibilities for a collection site in Decatur and received encouraging information. We then approached Macon County Sheriff Thomas Schneider about a drop-off site at his office. 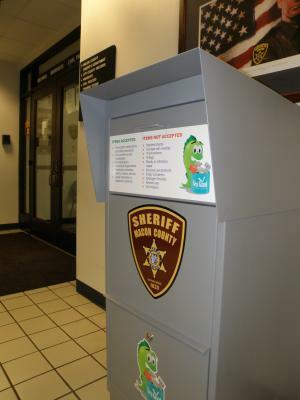 Sheriff Schneider was enthusiastic about establishing a collection box in the lobby of the Macon County Law Enforcement Center. Why do you think this is an important issue? Safe, secure medicine disposal reduces the risks of accidental poisonings, drug misuse and pollution. Read more.